The galaxy I Zwicky 18, originally thought to be a young galaxy, actually seems to have formed around the same time as most other galaxies. The bluish-white knots in the heart of the galaxy are two major star-forming regions. 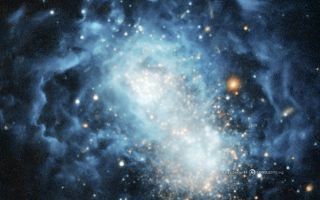 The galaxy I Zwicky 18, originally thought to be a young galaxy, actually seems to have formed around the same time as most other galaxies in this space wallpaper. The bluish-white knots in the heart of the galaxy are two major star-forming regions.